What if the most creative minds channeled their focus into solving the most impactful problems of today? Imagine if we could apply the ingenuity that powers the most profound technology into the most fundamental of all human concerns: health. MedHacks is the start. 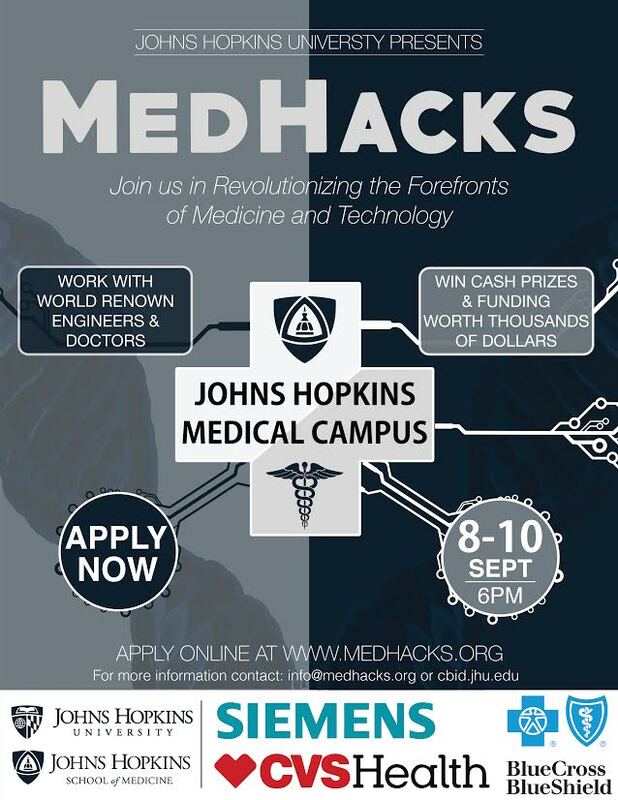 Join us for our medical hackathon at the world’s pinnacle of medical care, Johns Hopkins University, on September 8-10. At MedHacks 2017, we’re selecting the top innovative technologists, scientists, healthcare professionals, and engineers to build amazing things. Hackers across all disciplines will unite to meet with experts in every part of the medical field here at Johns Hopkins to develop their solutions to healthcare problems across the globe. They will be able to network with industry leaders and compete for thousands of dollars of prizes from companies like CVS Health, Blue Cross Blue Shield, and the Johns Hopkins Armstrong Institute. Don’t miss out on this amazing opportunity to hack health and meet people from all around the world! Check out our website at medhacks.org/and apply (application takes less than 10 minutes)!